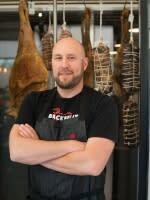 Chef Hosea Rosenberg is the executive chef and owner of Blackbelly and Santo in Boulder. Hailing from Taos, New Mexico, Rosenberg’s culinary path began while earning a degree in engineering physics at the University of Colorado. He worked at restaurants to help pay for college but quickly identified the work as his life’s passion, moving rapidly through the kitchen ranks. After studying under established chefs such as Wolfgang Puck, Kevin Taylor and Dave Query, Hosea landed his first chef position at Boulder’s Dandelion Restaurant in 2001. Subsequently, he spent six years working for The Big Red F Group, ultimately as executive chef of Jax Fish House in Boulder. His competitive work ethic and the experience he gained in these positions pushed Rosenberg to achieve national culinary fame when he won Bravo TV’s “Top Chef, Season 5” in 2009. By 2011, Rosenberg launched his own culinary business: Blackbelly, first as a catering company with a food truck and farm, which evolved into a full-service, brick-and-mortar restaurant in 2014. Its immediate popularity prompted Rosenberg to take over the space next door to open Blackbelly Butcher. The shop became Boulder’s only whole-animal artisanal butcher shop, also licensed to produce and sell cured meats. In its first year, Blackbelly was named one of 5280 Magazine’s Best New Restaurants, and every year since, it has been recognized as one of their top 25 restaurants in Denver/Boulder. In November 2017, Rosenberg’s second restaurant concept, Santo, opened to critical acclaim. A tribute to his Taos, New Mexico, roots; here, he serves a modern twist on classical northern New Mexican fare, applying a local approach to sourcing meats and produce in Colorado. Wake up to my beautiful wife, baby and dog. Take the short walk down to Spruce Confections where we enjoy a little coffee, some treats and catching up with the neighbors. Grab a green chile breakfast burrito from Blackbelly and head to the mountains for a hike in summer or some skiing in winter. Or if it’s a more mellow day, go fly fishing and lie about how big the fish were. Once back in town, regroup with the family unit and head to Avery for some beer, BBQ and relaxation time. Unless, of course, there is a show at Denver&apos;s Red Rocks Park and Amphitheatre — in which case we go rock out. Get home, sip on some Leopold Bros. whiskey, and cuddle on the couch to whatever show we are digging at the time.